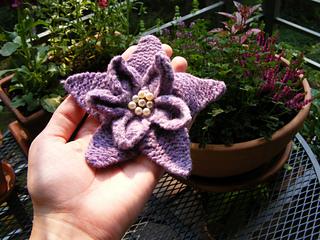 Heliotrope is a great way to use novel techniques and end up with a small, quick-to-finish project to show them off. This brooch makes good use of small bits of hand-dyed or hand-spun yarns. Pattern uses wrapped short-rows, increase by working into front and back of a stitch, double decreases (sssk, k3tog, & sl1-k2tog-psso), fulling, and sewing on beads and a safety pin post-knitting. It is helpful to be familiar with these techniques prior to working, but isn’t necessary.